At a capacity of 41,268 fans, Wrigley field is 12th smallest ballpark in the major leagues. At a capacity of 56,000 fans, Dodger Stadium is the biggest in all of major league baseball, by over 10%. For the Cubs World series last year, a total of 6,451 tickets were available on the secondary market across the three games at Wrigley. At the final price for each game, that equated to a total secondary market size of $22 million. The day after clinching, there were over 23,000 seats available for the four potential games at Dodgers Stadium in the 2017 World Series. While prices are down about 10% over the last few days, even at current levels, that equates to total secondary market size of $70-plus million, over three times the size of the Cubs last season. All Dodgers Games are available here, with prices starting from $750. 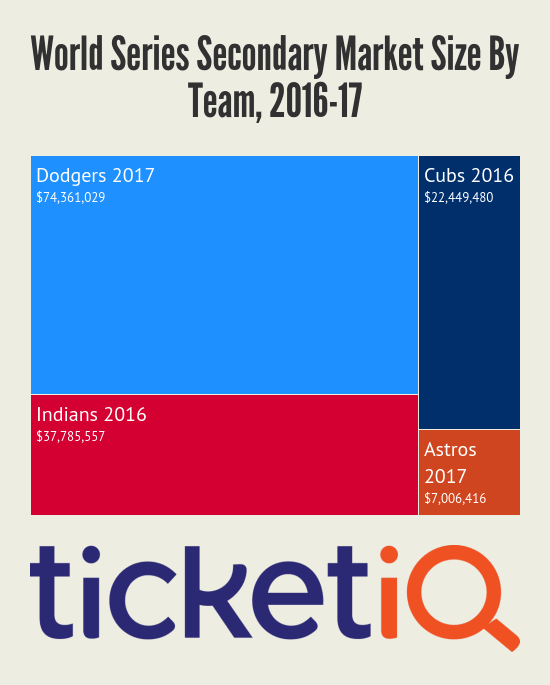 As the below infograph shows, what's even more surprising is that that in last year's historic World Series, the overall market was about 30% larger for Indians at Progressive than the Cubs at Wrigley. Cubs fans will point out that they filled about 50% of seats for game 7, which was overall game in terms of gross listing value. At it's peak, there were 4123 tickets available at an average price of around $4,000, which accounts for roughly half of the overall series gross. Add to that the 25% of Cubs fans at the other games and more of the majority of gross was spent by Cubs fans, in either Chicago or Cleveland. Over the last twenty years, the trend for new stadium construction is toward small and intimate. Built in 1992, Camden Yards was the model for the new intimate stadium, and was the antithesis of the generic multi-purpose stadiums built in the seventies and eighties. At a capacity of 45,917, Camden Yards is relatively large compared to more recent construction. Citi Field, built in 2009, seats only 41,922 while Minute Made Park, home of the Astros, holds even less. 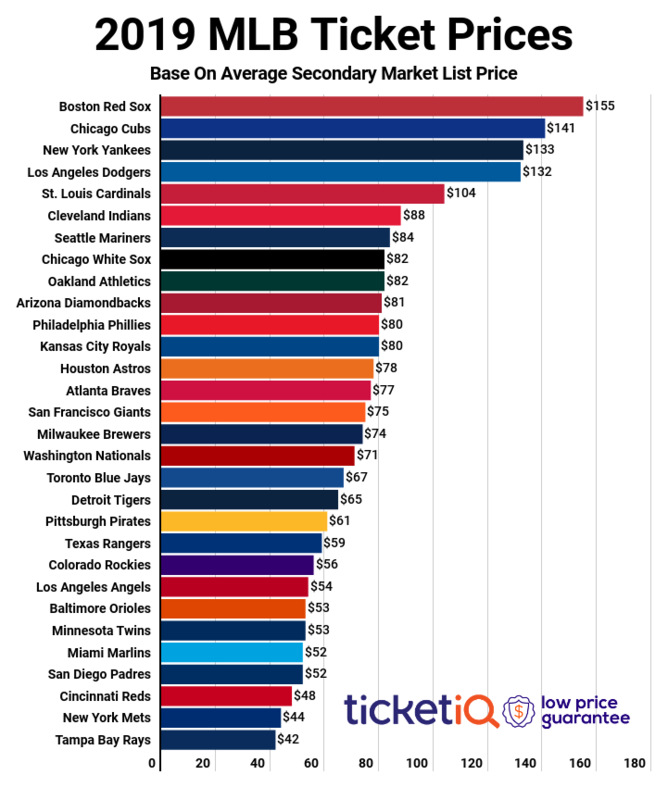 While Astros prices are historically expensive, they're about 25% cheaper than they are at Dodgers Stadium. The Mets and Giants, two teams inextricably linked to the Dodgers, round out the six most expensive series we've tracked since 2010. The Wild Card: Who Will Punch a Ticket?